Celine’s husband suffers from allergies to animals so when Celine decided to get a family dog, she wanted one that shed as little fur as possible. Celine also wanted a gentle, good-natured dog for her two young children. 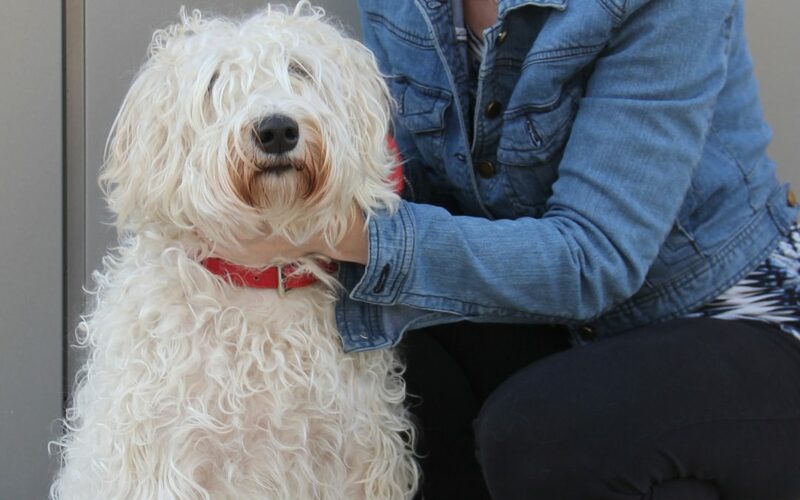 The Soft Coated Wheaten Terrier, a native Irish breed, fitted this description. She contact the Irish Kennel Club and found an experienced breeder who was very helpful. Elle was carefully chosen to be the family pet in Celine’s household. Elle had originally been destined to be a top pedigree dog show winner, so she was well socialised and trained as a puppy. It was only as she matured that it became clear that her coat was “too white”, so that she would be unlikely to win top prizes in the show ring. She was six months old when she was offered for sale. Celine wanted an older pup in any case, to avoid the complexities of dealing with a young puppy in a busy household: Elle was the perfect choice. The breeder carefully checked Celine’s household out too: she wanted to be sure that this much-loved pup was going to a good home. Elle has turned out to be the ideal family pet: a furry best friend for Celine’s children. When she came to BrayVet last springtime for her annual check and her booster vaccination, the vet asked Celine if she’d consider volunteering her as a blood donor: as an easy-going, large dog, she’d be perfect. Celine agreed, and Elle’s name as added to our list of possible blood donors. There’s no official blood bank for dogs in Ireland, but from time to time, dogs need life-saving blood transfusions, just like humans. Many vet clinics have an informal, ad hoc system, keeping a list of local dogs that would make appropriate blood donors. When there’s a crisis, they then phone around the names on the list until they find a donor who is available on the day. For Elle, that day came on Monday 9th December. Celine works from home, and the phone call came in during the afternoon. A dog had been hit by a car, and he needed an immediate blood transfusion to save his life. Was Elle available to help out? Celine immediately got into the car with Elle and drove down to our clinic. Her young son, Conor, was with her, so this was a big adventure for him too. Elle was left in at the clinic at 3.30pm, and Celine and Conor went back to collect her three hours later. When the vet came out to hand Elle back to them, she spoke directly to Conor: “Your dog saved another dog’s life today”. She went on to explain that the other dog also came from a family home with two children, and thanks to Elle, they would be celebrating Christmas with their pet by their side. Conor was in awe at the magnitude of the effect of his dog’s generosity. Elle was unaffected by her good deed of the day: just like humans, dogs can donate blood without any visible impact on their own health and well being. She carried on happily with life as normal. Celine’s children received a useful lesson about blood donation: Conor’s account of his life-saving dog was the story that made the “news of the week” in his class. The dog that received the blood donation – a Springer Spaniel called Patch – nearly died that day, but thanks to Elle’s blood donation and some major surgery, he pulled through, and he’s now back to full health. Do you want your dog to save another animal’s life? Talk to your local vet about blood donation.